Standing on the threshold of starting my spiritual ministry when I prayerfully waited upon the good Lord, as to the preamble of my ministry, the afore-recorded words of Peter summing up the earthly ministry of the Lord Jesus Christ appealed to me more than anything else, as the word �Good� which He symbolized throughout His life is truly an �all encompassing� word. It can be applied to all His thoughts, words & actions. Be it His �clarion call� to the people of His generation �to repent� or His � teachings� which oozed with �wisdom�, His �great miracles� which aimed at providing succor to the suffering, His �training up� of His disciples to carry forth His message to the world, His �counseling� of the confused lot when they came to Him for guidance, or His 'Final triumph on the cross' & His subsequent 'glorious resurrection', culminating in 'ethereal ascension'.... everything about His short, purposeful, dynamic life was �Good�. While it was �tall order� for His early followers� to toe His line �of going about doing good�, they kept at it, believing that the �enablement� to be like Him emanated from Him alone (Philippians 2:13). If the branch were to adhere to the tree, the �sap� would naturally flow into it. So, in spirit, the early Christians remained close to Him (Acts 9:31 /John 15:5), with results, which is there for all to see. In this connection, I would like to recite an interesting anecdote, which occurred in a prayer meeting at Chennai some years ago. The believers there were debating about the �success� of the ministry of apostle Thomas in India till one little girl (some little ones admittedly carry a very wise old head on young shoulders) summed it up by saying � What other proof we need about the �success� of his work. The very fact that we are all gathered here now � nearly 2000 years later after his work ended - representing the �body� of Christ is proof enough of the �success� of His work in our great country. No, his exemplary life & martyrdom in the Indian shores were not in vain�. While on the subject of apostle Thomas (permit me to side-track, just a bit), I had often wondered in the past as to why Jesus chose 'doubting Thomas' of all apostles to minister for Him in India (our great country), a person whose name is dubiously synonymous with cynicism, till I heard an insightful remark of one of the high-ranking officers - a very broad-minded gentleman outside the Christian faith - of my erstwhile organization during one of our ecumenical discussions that Jesus was using 'horses for courses' policy long before that phrase became a part of contemporary management parlance. Only a rationalist like Thomas could have logically expounded the deep Biblical precepts to men who were well founded in matters of religion (Indians as always were quite religious at that point of time). I, Jesus' weak servant (much weaker than apostle Thomas ever was) encouraged very much by the fact that my works are of �eternal significance� now nearly 2000 years later attempt by virtue of this ministry to toe Christ�s line �of going about doing good� fully acknowledging the fact that I am merely �a branch� of the �true vine�, from which I get my �nourishment�. This Ministry�s �doing good�, in effect its aim shall be strengthening the faith of those who already know the Lord and inspiring those who have never known Him personally to enter into a �personal relationship� with Him, all the while trying to rekindle the love of those who have lost their �first love� for the Lord. By virtue of preaching, teaching, counselling & writing - hoping all along to put to �good effect� the �talents� entrusted to me (Matt 25:14-30/ I Corinthians12:28-30) - I embark upon the mission of achieving the afore-stated goals amidst three categories of people outlined above in my local church & in other churches�/gatherings� where I am invited to minister the word of God. What would be my �strategic formula� of going about my work? Not try to practice what I preach but preach only what I practice, then only my preaching would carry conviction & punch. Talking the walk, any day is more effective than walking the talk. Only with a lit candle, we can light up the unlit candles! Right? And my pace of working? ONE DAY AT A TIME! A word of caution�for those who are regular Bible readers with a specific time set apart for personal devotions, my on-line ministry ought to be only �supplementary� in nature to their spiritual life & not �substitutionary� for the good system, they already have put in place, for there can never & should never be a full-fledged substitute for personal devotional time involving reading of God�s word. 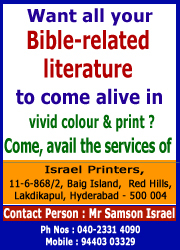 On the other hand, if my Ministry, develops �an appetite� for Bible in the hearts of those who are not regular Bible readers, then nothing quite like it! The style of this ministry shall also be like that of His, which did not aim at remaining politically correct to placate the audience (playing to the gallery), but to state the truth, as it is, with due love & concern. Yes proper care is also being taken to ensure that communication (oral or written) at all times � to the best of my ability - remains lucidly simple, as I am hoping to reach a wide cross-section of the society (including people of all ages & educational backgrounds) through this ministry.